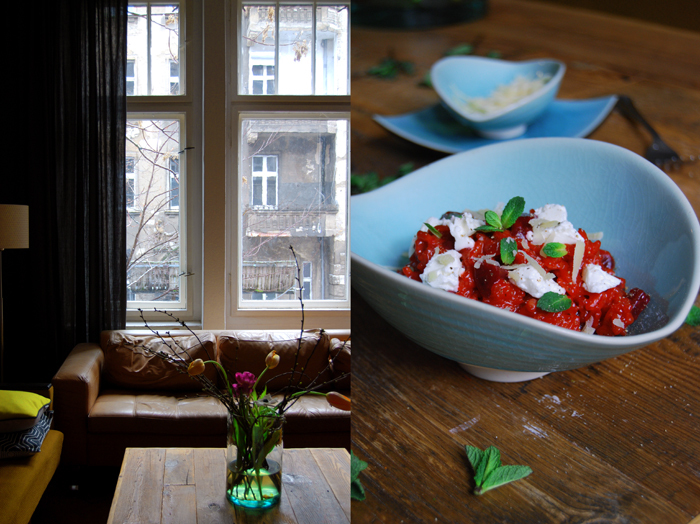 On to part II of Berlin’s Hauptstadtmutti cooking session! 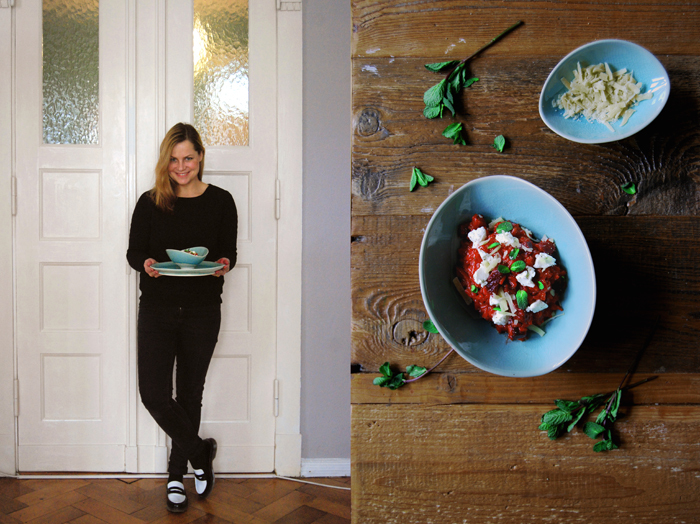 The popular mother, fashion and lifestyle blog is run by Isa and Claudia, both such vibrant and inspiring ladies that I had to visit both of their culinary spaces. Two weeks ago, I learned how to make Claudia’s Ukrainian Pelmeni dumplings (you can read about it here) and now it’s time to cook in Isa’s kitchen. It was cold and snowy as I made my way to meet Isa, the city was wrapped in a wintery grey and, although it was already 10 in the morning, it was quite dark when I reached the old house where the young mother lives with her little family of four. The imposing building is one of the few on the street which hasn’t been renovated, the facade crumbling between the majestic window frames which gives it quite a morbid charm, you can still see the beauty of the past. It looks a bit like an abandoned house in a fairy tale, it’s more than impressive and it sparked my fantasy when I walked up the creaking steps to knock on Isa’s wooden door. But then, when I entered her home, I was speechless, endless rooms and corridors, herringbone parquet floors, high ceilings lined with decorative stucco and large windows which let in the most dreamy light. 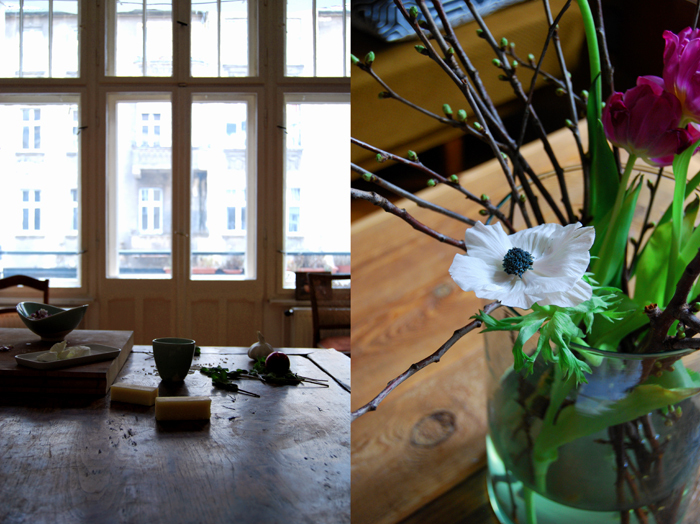 Within seconds I fell in love with this elegant but cosy home! 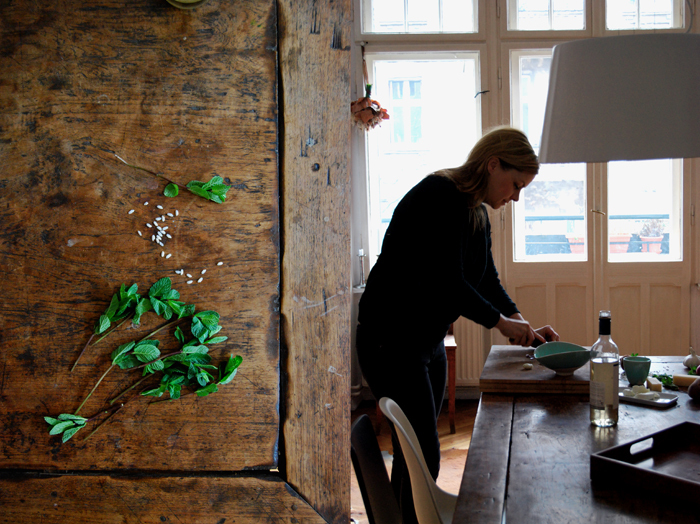 Isa started Hauptstadtmutti in 2011 together with Claudia. In the first part of our cooking series I talked about their fascinating and complementary personalities which led to the two meet in your kitchen features. Both women share an international upbringing which confronted them with various cultures at a young age. Claudia grew up with an Eastern European background and Isa had quite an adventurous childhood, she lived in Baghdad in Iraq during the first 4 years of her life. Her father was a successful engineer who used to live in East Germany with his wife before his skills took him and his young family to the Middle East to design pump stations. Back in East Germany, he was also involved in the construction of the GDR’s first nuclear power station. Despite this experience, or perhaps because of it, the whole family turned to a more alternative lifestyle in the following years. They became politically active, focussed on natural home grown food and raised awareness for healthy living. As a teenager, Isa joined yoga and meditation classes together with her father and mother. Today, her parents practice Tai Chi together with their friends in the family’s grand garden which is part of an old farm established by Isa’s grandfather. The family takes their well-being into their own hands, one generation after the other, and the next one is waiting in line. Isa passes her experiences on to her children and although they are still quite young they can already enjoy her delicious food. 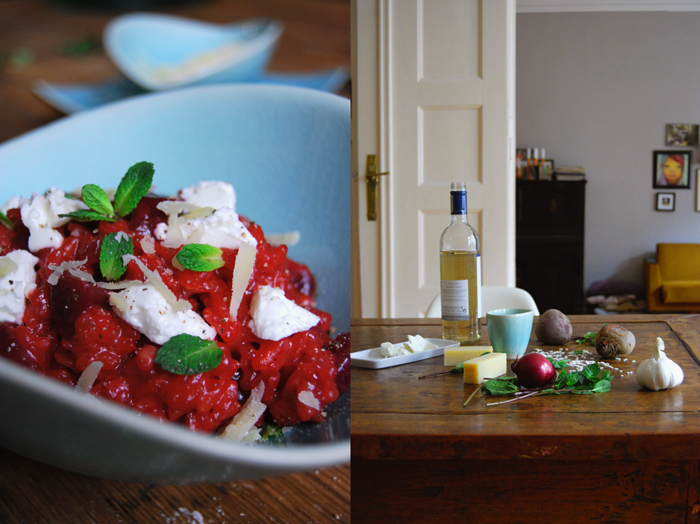 Isa’s cooking truly pleases the taste buds, she creates culinary moments of bliss without regrets, her food is healthy, with organic ingredients, and full of flavour. 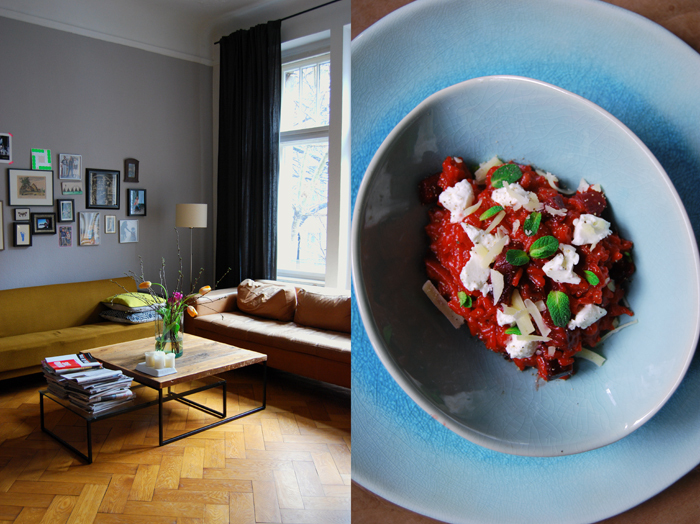 She made a fantastic beetroot risotto for me, it was cooked to perfection, the rice corns and roots were al dente, just how I like it. 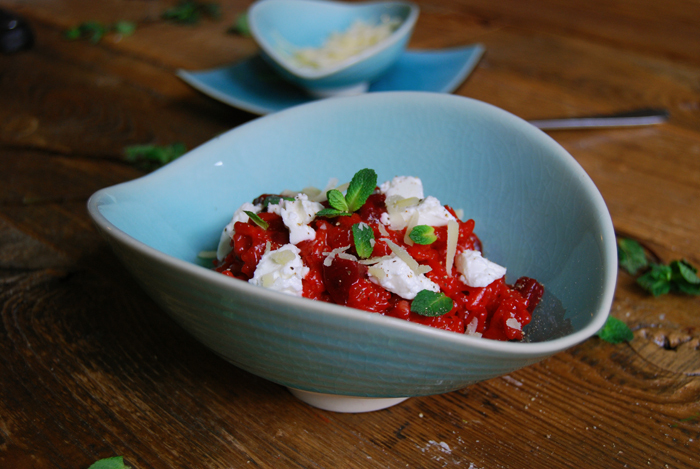 She refined her composition with chèvre, parmesan and fresh mint – a great composition I can only recommend! 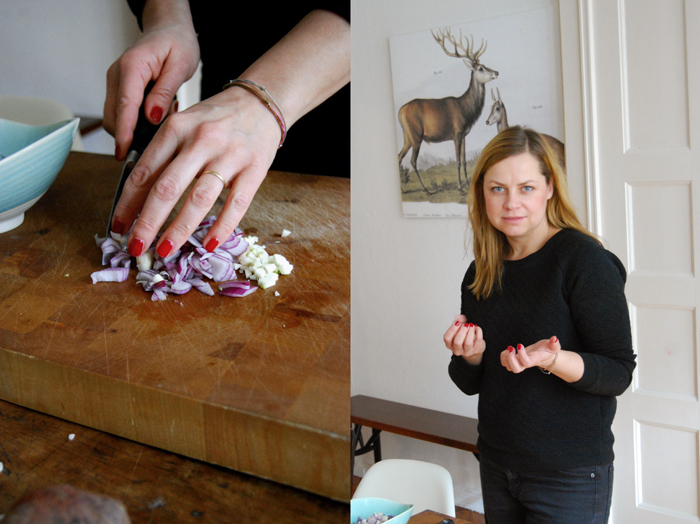 Peel the beetroot, garlic and onions and cut them into cubes. The larger the beetroot cubes, the more bite they’ll have. Warm up the broth in a saucepan, it should be simmering. In a large pan, heat some olive oil and cook the onions and garlic until glassy and soft. 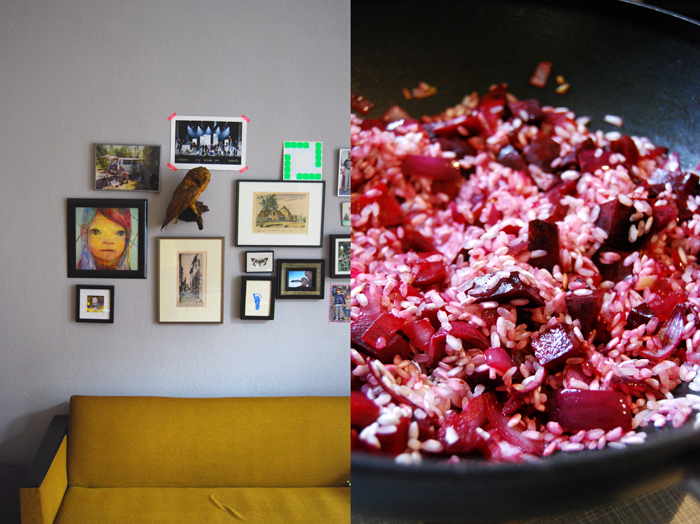 Add the beetroot and honey to the onion and let it caramelise slightly, add the rice and let it cook for a minute. Deglaze with a splash of white wine and add a ladle of broth. When the liquid has been absorbed add more broth, a little at a time stirring in between. When the rice is al dente, take the pan off the heat. Stir in the butter and parmesan cheese and let them melt into the rice. Season with salt and pepper to taste and sprinkle with chèvre and mint to serve. You spent the first three years of your life in Iraq due to your father’s work as an engineer before your family moved back to East Germany. How did this experience influence your family and how did it effect your own personality? Concerning that I should probably explain that my parents were neither in the communist party nor in the homeland security of former East Germany so it was quite a mission for them to get to live and work outside the country. But they made it because of their skills and raised my brother and I to believe that “You can get everywhere if you really want it”. That really brought me to a lot of places and made me later want to live in other countries as well. We also have a very open minded attitude towards other cultures in our family. Do you think traveling is important for children to get to know different cultures and mentalities? Can you give some tips for traveling with young children? If they are very young I don’t know. They will not really remember it. We did not travel too far away with our kids yet. Switzerland, France, Denmark. It is not that stressful for them but sometimes for us, the parents. Sometimes it is more fun to spend a week at the Baltic Sea than to travel for hours and hours. It is always good to have plenty of books with you, especially Wimmelbücher (picture books). Your parents encouraged a great awareness for natural food and a healthy lifestyle by their own way of living. How did they influence your consumption, your cooking and the food you buy? Oh yes, my mother was very into healthy food when we were young and still is. She cooks her own jams from the fruits of her garden and we always ate fruits and vegetables from the garden. She always uses fresh and natural ingredients. The older I get, and of course with children, I try to live as healthy as I can too. I usually buy local or organic fruits and vegetables. You went to high school in the US for one year, what fascinated you about this new culture? What are your culinary memories? Everybody was very very friendly and I just had a very great teenage time there. Culinary memories? Donuts, cheeseburger, tacos and ice cream (smiling)! 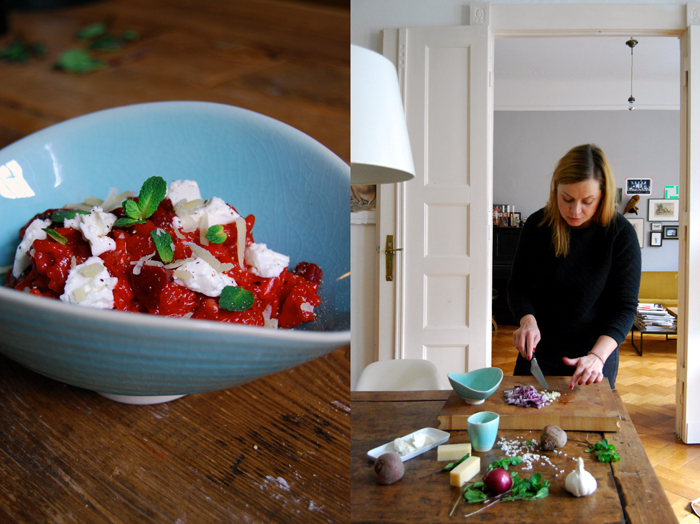 As an au pair in Paris, you also experienced the French cuisine for one year. What did you like about the food there? It is very pure, many vegetables and beef and lots of seafood. I liked that very much and the oysters. I learned how to eat oysters. Delicious! Did your cooking change since you became a mother? Do you have any tips to make cooking for and eating with young children easier? I really changed into organic and local food. Eating with young children is easy. I always cooked the baby food by myself. This is totally easy and does not take a long time. What I learned is that young children want a variety and a change of food every day. They do not like to eat the same thing every day over and over. My tip is to always try to eat the same as your kids. They copy you and will (often) try more. The first dish was Spaghetti Bolognese. I learned this when I was 12 when my mother was away for an allergy cure and our father taught it to my brother and I. As a fashion observer and blogger, which are your 3 most helpful fashion tips for young mothers? 1. Always carry a large scarf for nursing in public. 2. Get a new haircut. It makes you feel good. 3. Buy at least 3 shirts or dresses which make nursing comfortable. In Berlin, walking around the city and on the internet reading international blogs and magazines. I love to eat at Cordobar. Great food and the largest selection of wine. And I like to buy food at Mitte Meer. Janine (a friend), roasted root vegetables. Spaghetti Bolognese and now it is fish, especially Sushi.